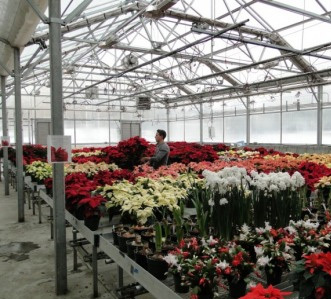 The BYU-Idaho Horticulture Department evaluates the performance of over 50 poinsettia varieties from around the world. Varieties are trialed yearly starting in July with the culmination of color in December. Students participating in the trial develop skills in the scientific process, growing, producing, and marketing poinsettia crops. Through this, students build contacts with plant breeders, horticulture companies, and industry leaders.